← Fifty Shades of Andalucía: It will take your breath away! Look out for these street signs! It’s the same the world over! Finding a parking space is getting more and more difficult, no matter where you live. You might have thought it would be an easy matter to park your car in any one of the pretty white villages in the Axarquía but, in some of them, it’s almost impossible. The difficulty seems to arise because there is no time restriction. Once you’ve parked your vehicle, you can stay as long as you like – which is all very well when you can actually find a space in the first place! 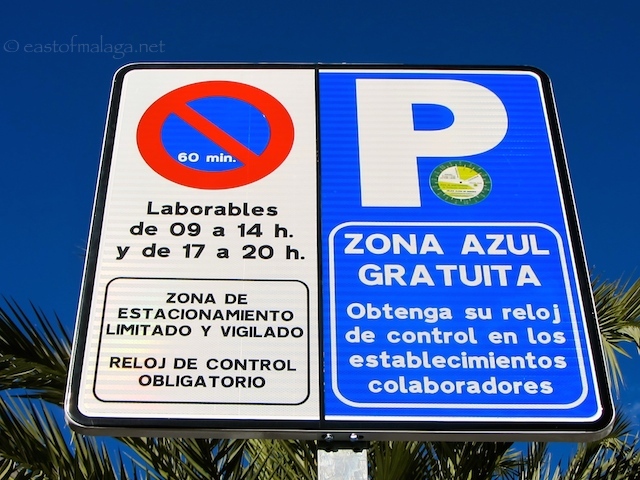 Two years ago, to try to alleviate this problem, the town hall in Torrox introduced Blue Parking Zones (Zona Azul) around the centre of the village. 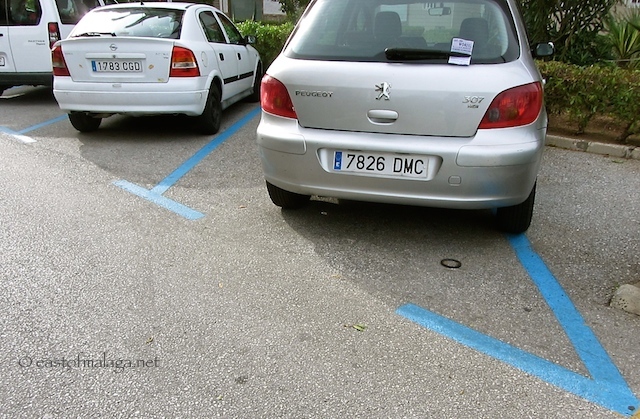 This means that during certain times of the day, if you park where there are blue lines painted on the ground, you need to display a parking disc with the time correctly set to coincide with your arrival time. The reusable parking discs can be purchased from most of the shops in the village for a one-off payment of €1. Once you have your disc, each time you park in the Blue Zone during ‘working hours’ (Monday to Friday, 9am – 2pm & 5pm – 8pm) you need to set the time on your disc to your time of arrival and the gap on the disc will indicate when you need to leave. You must display your disc, clearly visible, on the dashboard of your vehicle. Within Torrox village, you are restricted to ONE hour of free parking. Outside of these times, including weekends, there is no restriction. This means that if you arrive at 1.30pm on any weekday afternoon, you can safely park until 5.30pm without a problem. Of course, if you overstay your allotted time, or fail to display a disc, you will be faced with a hefty financial penalty. All pretty straightforward you might think. 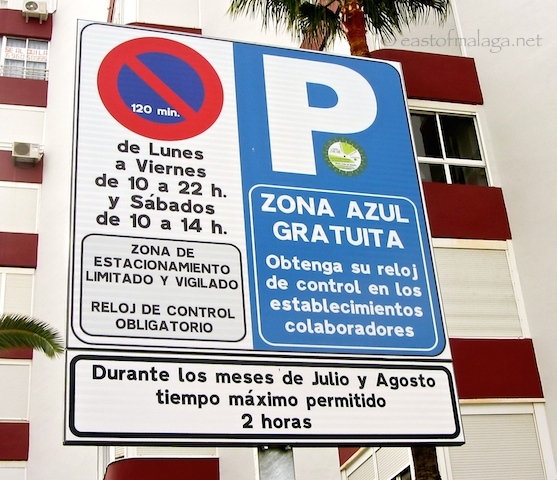 The Blue Parking restrictions were extended to certain areas of the coastal area of Torrox Costa, last summer. On the coast, parking is restricted Monday to Friday, 10am – 10pm and on Saturdays between 10am and 2pm. The scheme apparently works the same way as in the village, with the difference being that on the coast you are entitled to park for TWO hours free, instead of one. 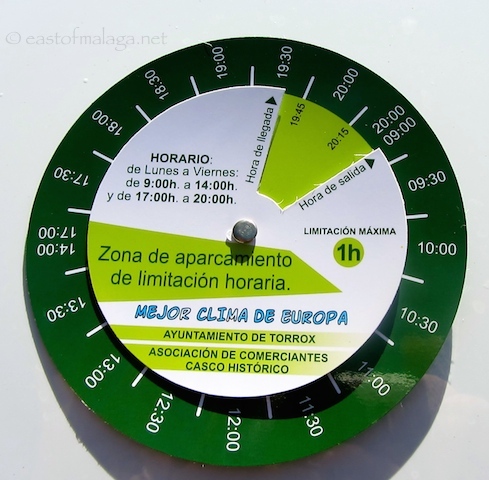 This means, I presume, that you will need to purchase a different parking disc for €1 from a shop in Torrox Costa, as the gap indicating your allotted parking time (two hours) on the disc would be different from the one you can use in Torrox village (one hour). What is confusing (to me, at least) is the extra part at the bottom of the sign that indicates that during July and August the maximum time for parking is two hours. Does this mean outside of the restricted hours, too? Or that you are only allowed to park once (for two hours) and then you have to clear off? Confused? I know I am! Of course, there have been some disgruntled drivers who object to the timed parking restrictions but, from a personal point of view I think the Blue Zone parking scheme works very well within Torrox village, as I really appreciate being able to always find a parking space since the system was introduced. However, the scheme down on the coast at Torrox Costa is pretty confusing. Are Blue Parking zones appearing in a white village near you? What do you think about them? This entry was tagged Andalucía, customs, East of Malaga, Europe, life, Malaga, Spain, Torrox, Torrox Costa, travel. Bookmark the permalink. Just take the bus and no more headaches haha! We’ve only been to Torrox once, to the village and the coast. The village was lovely although quite small, I think I’d probably get bored living there. It was Christmastime and EVERYTHING was closed on the coast. Everything! The only place we found where I could load up my son’s large stomach (and he really loaded it up with several sandwiches!) was a German bar with lots of flashing coloured lights. All those coloured lights in the darkness haha. In my experience, everything closes at lunchtime on Christmas Eve for the Spanish to enjoy their evening together. All the restaurants open on Christmas Day. Apart fro Ireland and England, continental Europe have Christmas dinner and festivities on December 24th. I’ve lived in Denmark and Germany and found this to be so. Ha, it might not matter unless they’re strict about that there too. I hope you’re well. Driving in Spain is a doodle, Gilly – the roads are VERY good and there is only a fraction of the traffic in the UK. It’s just the parking around the little villages, with narrow streets that’s the problem (or the parking signs!!). Best to go out in the quiet of a Sunday afternoon and drive around to get some confidence. Around 3.00 p.m. Is a good time when most are having lunch! A good place is the Feria ground next to El Ingenio. Well, it does sound like a good scheme. Here in Jimena, you can park for free anywhere there isn’t a yellow line. Depending on what time we get back, we could park just round the corner from our house, or 5 minutes walk away. When there is a feria, could be miles away….Got used to it but visitors find it amazing that we have no parking outside the house!